When Kyle Phillips is involved in the design of a course, everyone expects something special. After all, this is the man who created the mighty Kingsbarns in Scotland. What could he do in the delightful picturesque Austrian surrounds between Kitzbühel and Aurach? Well, the answer is simple: he's designed yet another amazing course, where each hole is a unique and often breathtaking experience. Eichenheim is the newest course in the state of Tirol. It opened for play in 2000. The area around the renowned mountain village of Kitzbühel has become as popular for golf in the summer as it is for skiing in the winter. The layout wends its way though the most incredible Alpine terrain with the Wilde Kaiser mountain range providing a dominant background and deep canyons and lush deciduous forests providing focus for the foreground. It's quite a scene. The course blends seamlessly into this overwhelming panorama, totally in keeping with Kyle Phillips' design philosophy, which stems from the belief that golf courses should have their own character and personality derived from the site's existing natural features. The only drawback in this big landscape here at Eichenheim, is that distances are hard to judge, so we recommend a course planner for first time players. Many of the tee shots are played from elevated tees, which provide a clear view of the daunting prospect at hand. This is particularly noticeable on the par threes, where many of the tee shots must be struck high in the air to find the green sited far below. A notable exception is the 6th hole where a towering shot is required to find the blind green that's set high above the tee. Eichenheim is not a long course, measuring 6,057 metres from the tips, but it's certainly challenging and was well received by the pros when they hosted the Austrian Masters here in 2001. When it comes to mountain golf courses, there is always a lot of room for discussion and controversy as to the value of the course, the difficulty due to terrain or distribution of the holes across hills and valley, the often inevitable distance between green and next tee, and of course regarding the landscapes viewed from the tees and fairways as a counterbalance to the special physical exertion needed to navigate the course. Eichenheim is no exception. I have to admit that I did not walk this Kyle Phillips creation. I certainly did mull over some of the uphill paths between holes and I believe that many golfers who try to discover Eichenheim on foot without knowing what is expected of them will curse loudly and often, after they regain their breath at the top of the hill, or at the end of a long transition path. There is not much one can do about it, the Alps are not a range of soft, undulated hills, but a mass of sometimes raw and abrupt gorges and ridges, as one can see all around this golf course. In fact, even though the course looks pretty natural, Mr. Phillips’ team moved hundreds of thousands of cubic meters of soil to create fairways across the slopes that would not be impossibly slanted one side or the other, and to make room for greens with manageable break lines. So get over it, take as many breaths and breaks as needed, and make sure you don’t miss the other facets of this experience. Not only is the design sometimes breathtaking due to elevated tees, cleverly placed bunkers or integrated elements of “natural” décor such as wooden shelter huts, but the condition of the course is really very, very good, even in May when I visited, only four weeks after the course was last covered in snow. The most spectacular hole is probably the par-five 3rd, with its tee at the top of a cliff (which you have to climb down to get to your second shot), except for the forward tees which are located at the bottom of the depression, which the hole scans. Still, the “signature hole” would be the par-four 9th, a short but narrow and tricky hole. It is only 316 meters long from the back tees, and goes downhill, but trying to get too close to the green may well land you in trouble, with out-of-bonds on both sides of the fairway, and a big pond (including a fountain of course) short of the green at the bottom of the slope. The green is tucked in the right corner with a couple of big trees protecting its right side from approach shots not coming in from the left side of the fairway. Also, the stretch around this hole, from the 7th to the 11th, is both very pleasant to the eye and not so easy to score well on. True, the 16th and 17th par-fives run parallel to each other, head to toe, and do not seem to pose any great difficulty or diversity, but the 15th was a nice par-four with a blind tee shot over the end of a plateaued first stretch, with a downhill approach after the dog leg right. And the 18th is a tough finishing hole despite its relative shortness at 282 meters from the tips: it runs uphill from tee to green, there is a mass of bunkers defending the elevated green where your approach shot will be probably be blind (it is strongly recommended to take advantage of the stroll along the 15th fairway to take a long look at the 18th tee and get your bearings for later). Eichenheim was hailed as one of the most beautiful golf courses of Austria when it opened in 2000. Is it still? Of course I have not been everywhere, but the fact remains that if you are a golfer who also appreciates scenery around and beyond the fairways, this course offers spectacular moments. After all, you do get a direct view from the golf course on to the mountain where a key World Cup downhill ski race takes place every year in the winter, on the Streif piste. Besides, the clubhouse is directly part of the opulent Grand Tirolia hotel & spa resort complex, where you can enjoy many material moments of bliss beyond the sinking of a long putt! Eichenheim provides for very good golf and its condition is impeccable in season, so it must still be regarded as one of the top venues in the country, despite some great, more recent additions to the Austrian golf portfolio. The main drawback of Eichenheim? The golf season is only 6 months long in average. Wonderful course in the Austrian mountains. Great layout. A lot of risk and reward holes, short but tricky. Greens were fantastic and all the course was in perfect shape.Everytime I'm near Kitzbühel I try to play this wonderful course.Better to take a cart, walking could not be so enjoyable. If you stay lomger, there is also a 5-star hotel on the course. I played this course last year. Although I have lived in Austria and skied in Austria many times, I had never associated Austria with golf. I took a golfing (but not walking) partner with me last year. I haven't played as many courses around the world as he has but even he had to admit it was probably one of the best courses he had played. I was captivated with the course. Not only did you turn a corner and not know what hole was coming next, but I found myself reaching for my camera far too often. The scenery is just stunning. I am putting in these comments as I am planning to play the course again this year and want to book a tee time. 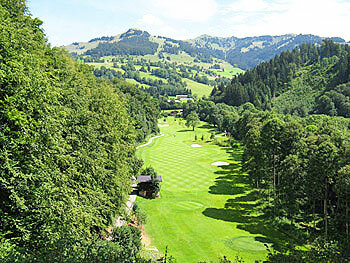 If you are visiting Kitzbuhel and you play golf, play here. You won't regret it. I have recently returned from a visit to the Austrian ski town of Kitzbuhel and played at Eichenheim twice during the 'Golf Festival Kitzbuhel'. The whole week is a delight and I would recommend it to anyone - golfers from all over Europe compete in a series of events at the various courses from the town and the Eichenheim course is certainly the pick of them all. The designer is Kyle Phillips whose list of achievements to date include Kingsbarns and Dundonald in Scotland and also The Grove in England. What is obvious at Eichenheim is the clever use of the land, which is at the bottom of a mountain. The opening four holes include two par fives and two par threes, with the highlight being the drive at the 3rd; an elevated par-5 tee shot that is around 90m above the fairway. If you have been lucky enough to play other Phillips designed courses, then the similarities in the green sites are easy spot; large with a fair bit of undulation but a joy to putt on. The 5th hole is played downhill and dog-legging at about 250 yards to the left, the 6th then turns back uphill and is the best par-3 on the front. The 7th is a clear birdie chance, a little uphill again but a shot of about 230 yards will leave an inviting pitch of around 90 yards. The best hole on the first nine (in terms of looks) could be the 9th; downhill and only 300 yards in length - certainly not drivable though as the green is protected by a very strategic pond/lake. The back-drop of the 9th is the onsite hotel, The Grand Tirolia which is one of the 5-star hotels that serves Kitzbuhel. If I am honest, the back-nine is not as good as the front but this is probably being a little picky. The 10th is a decent par-4 of around 400 yards, with more water involved short of the green. The 11th has a tough drive; to a fairway that drops from right to left and a fairly long approach. A par-3 is the 12th with the inevitable elevation change, this time downhill. A short par-4 at the 13th should be a hole that can be scored well on and another downhill par-3 is the 14th, this one around 160 yards. The 15th is probably my least favourite hole with a green position that just looks a little out of place (it would be good to hear other's opinions). The 16th and 17th are both heavily bunked par-5's, with the 17th being short enough to get close to in 2-shots. The final hole on this great course is similar to the 9th, in the fact that it is only around 300 yards and not really drivable - this time because it uphill with dramatic bunkering at the green. Golf in the town of Kitzbuhel and especially at Eichenheim is very charming and some-where I shall return to. Other courses that I played during this trip were the Kitzbuhel Golf Club (a very pretty 9-hole course) and the Schwarzsee Golf Club (18 holes and after a slow first six holes, the course explodes into an alpine delight). The golf season only runs between May and October in this part of the world and my advice would be to give it a go. Having played this course a couple of times I would advise anyone considering a visit to go. The club are not resting on their laurels but seem to be seeking constant improvement. For example, when I first played the course in 2008 the 9th hole was very weak being just a straight hole down hill. At that time it seemed to be just a means of getting from the 8th green back to the club house. However, the addition of the pond in front of the green has transformed the hole. The previous reviewer expressed the opinion that the back nine was not as good as the front. To an extent I would agree but there are still some great golf holes. The 11th is a long par 4, narrow with a biotope to the left and out of bound right. Definitely a challenge. And whilst the 13th is a definite birdie chance you can easily get a “cricket score” if you are not careful. The 15th is a hole you could love or hate. A sharp dogleg right so position from the tee is vital if you are not to be blocked out. The green is below you so club selection for the approach is critical. Does it look out of place? That is surely open to opinion. The one thing I am certain of is that it takes 2 good shots to hit the green. This is definitely one of my favourite courses and one I will certainly play again.